$24 Promotional Gift Card available on this product! This jacket has a fairly relaxed cut through the body. We measured a selection of sizes and also tried these on our fit test mannequins. Huey is wearing a medium and Dewey is in the XL. These are the sizes they normally wear. The fit looks good. I’d advise to choose the size you normally wear in men’s clothing. To make size selection easier, we’ve developed the chart below to help you choose a size based upon your chest and belly measurements. If you have a bit of a belly, just make sure that the jacket you choose will be big enough for both your chest and belly. Note about arms: The cut of the arms of this jacket are trim like a sport jacket. It includes armor and through the bicep and elbow areas, the sleeves are very trim. Guys with skinny or average arms will like the fit but guys with bigger arms probably won’t be able to wear the jacket with the armor in place. The new Hefe jacket is a STURDY textile shell with detachable leather sleeves, so this one can give you full armor and coverage or you can wear it as a vest. The shell material of this jacket is about the most sturdy fabric material I’ve ever felt on a piece of riding gear (and that’s saying something since I’ve seen a lot of gear!). It is made of a blend of DuPont® Kevlar® and Waxed denim. When you feel this material in person you’ll agree with me I’m sure. The overall style I think they were going for is a retro/garage. The waxed cotton look is from many decades back, but is becoming more popular again. The jacket comes with a set of removable armor for the shoulders and elbows and has a pocket for insertion of a back protector if you want to add one (see the link at the bottom of this page). the sleeves on this jacket are buffalo leather and fit quite snug like a race jacket style (see my sizing advice above). When you zip off the sleeves you have riding vest. The armor goes with the sleeves so it is no longer in play when you convert to the vest mode. 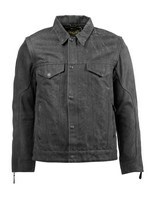 Roland Sands says: The Hefe is an evolution of the popular Honcho Jacket. With all new features that elevate this styles form and function. Featuring heavy weight 70/30 denim / DuPont® Kevlar® blend main body that provides top-notch abrasion protection. Articulated pre-curved sleeves in premium buffalo feature are fully removable, which allows the Hefe to be a 2 in 1 design that can be worn as a jacket or a vest. Snap down collar, leather accents and classic denim jacket styling, the Hefe is perfect for the rider looking for a versatile jacket that looks great both on and off the bike. Versatile classic denim jacket that can be worn as a vest.